Havelock Island, officially Swaraj Island, is the one of the largest islands that comprise a chain of islands to the east of Great Andaman in the Andaman Islands. It belongs to the South Andaman administrative district, part of the Indian union territory of Andaman and Nicobar Islands. 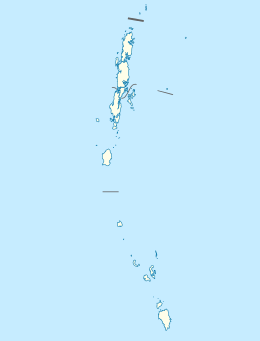 The island is 41 km (25 mi) northeast of the capital city, Port Blair. Havelock Island is named after a British general, Sir Henry Havelock, who served in India. In December 2018, it was renamed as Swaraj Island as a tribute to Subhas Chandra Bose. Bose had hoisted the Indian flag at Port Blair on 30 December 1943 and proclaimed the Andaman and Nicobar Islands as territories liberated from British rule. He had subsequently named Andaman Island as Shaheed and Nicobar Island as Swaraj. On 30 December 2018, Prime Minister Narendra Modi announced that Havelock Island would be renamed as Swaraj Island. 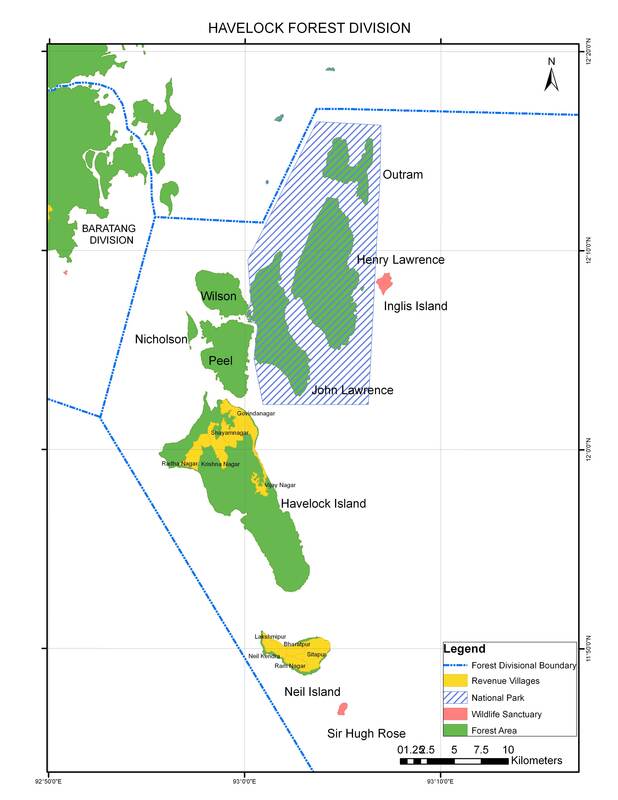 The island belongs to the Ritchie's Archipelago and is located between Peel Island and Neill Island. Politically, Havelock Island is part of Port Blair taluk. The island's current[when?] population of 6,351 consists of mainly Bengali settlers. Many of these settlers have East Bengali origin as these people were given settlement by the Indian government after the Partition of India in 1947. Radhanagar Beach on the western coast, also known as Number 7 Beach, is one of the most popular beaches on Havelock and was named "Best Beach in Asia" by Time in 2004. Other notable beaches include Elephant Beach on the northwest coast and Vijay Nagar Beach (No. 5), Beach No. 3 and Beach No. 1 on the east coast. Kalapathar is another famous beach. The island can be reached from Port Blair by government-operated ferries and private cruises. There are also helicopter services. A local bus connects the jetty and villages on an hourly circuit. ^ "A&N Islands - Pincodes". 22 September 2016. Archived from the original on 23 March 2014. Retrieved 22 September 2016. ^ Llewellyn-Jones, Rosie (2007). The Great Uprising in India, 1857-58: Untold Stories, Indian and British. Boydell & Brewer. p. 168. ISBN 978-1-84383-304-8. ^ Ananya Bhardwaj (25 December 2018). "Andaman's most-visited islands to be renamed during PM Modi visit". Hindustan Times. Retrieved 31 December 2018. ^ "Narcondam Island". Directorate General of Lighthouses and Lightships. Retrieved 18 October 2016. ^ "PM Narendra Modi renames 3 islands of Andaman Nicobar". The Times of India. 30 December 2018. Retrieved 31 December 2018. ^ A & N Administration. "Ferry Program for Neil, Havelock & Rangat". Retrieved 15 October 2013. ^ A & N Administration. "Helicopter Inter Island Schedule". Retrieved 15 October 2013. Wikimedia Commons has media related to Havelock Island. This page was last edited on 30 January 2019, at 02:30 (UTC).